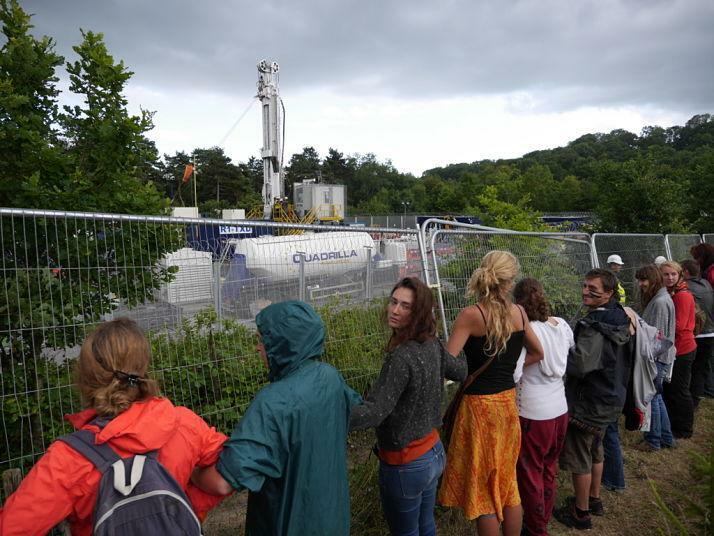 [caption id="attachment_9446" align="aligncenter" width="714"] Cuadrilla Balcombe Site 18/08/2013[/caption] By Charlotte, Frack Off With the fracking industry poised to attempt its largest assault on communities across the country to date, and what would be its most significant advance in this country since 2011 if not resisted, it seems an appropriate time to take a look back at what has led to this threat we are facing and examine what we are fighting for. The Fracking Threat The last decade has seen an explosion in unconventional oil and gas drilling as easy to extract hydrocarbons have become harder to find. The system has been forced to resort to new and increasingly more aggressive extraction techniques. While oil prices are currently well below their 2008 peak, and new drilling has stalled in many places, this hasn’t stopped preparations for continued expansion once prices rise. Places where fracking has broken out of its US/Canada/Australia incubation zones include Argentina’s Vaca Muerta (“Dead Cow”) Shale where 400 wells have been drilled so far and Essar Energy’s Raniganj Project in West Bengal where almost 300 coalbed methane (CBM) wells have been drilled to date. While small compared to the hundreds of thousands of wells which have been drilled in the US, tens of thousands in Canada and over 7,500 in Australia, this could be just a foretaste of millions of wells coating large swaths of the globe, if not stopped. The impacts of these wells, often drilled at densities of 8 wells per square mile or more over large areas, on local communities has been extensively documented (from air and water pollution to spills and explosions). What has received far less attention is the systemic impact of these new, more expensive, energy sources on our societies as a whole. Fracking (unconventional oil and gas) wells are expensive (and produce much less oil/gas per well), with a one shale well in the US often costing in the region $10 million. Multiplied by the hundreds of thousands of wells drilled to date this add up to a rather hefty pile of cash (measured in trillions of dollars) and it is unsurprising that energy prices have needed to rise to try to pay for. We are now learning, from Goldman Sachs, that the fracking “boom” has driven oil and gas investment returns to 50 year lows (not that someone hasn’t been profiting somewhere, but costs of extraction have been rising faster than energy prices), confirming the perceptions of a pyramid scheme driven by investment hype. [caption id="attachment_9447" align="aligncenter" width="696"] Multiple Multi well sites in the U.S[/caption] Extreme Energy The interaction between the global economic system and the fossil fuel extraction industry which fuels it is highly complex in its details but extremely simple in its essentials. It takes energy to extract energy, so some fraction of the energy produced by the fossil fuel industry needs to be fed back to power further extraction, rather than be used by the rest of society. In the past that fraction was small, a few percent or less, and could be easily ignored, though it was constantly growing as easier to extract energy sources were depleted, and slightly harder to extract ones replaced them. A slow, incremental increase in the overall extraction effort as wells had to be drilled a little deeper or multiple smaller fields targeted in place of larger ones. The peaking of conventional oil production in the last decade or so has changed all this, with extraction effort exploding as new, more intense chapter of fossil fuel exploitation has got underway. 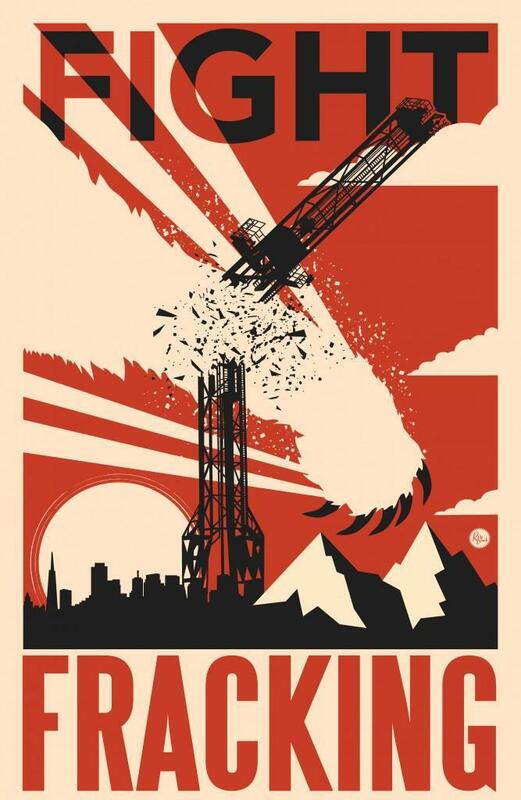 Fracking and other extreme energy extraction methods, such as tar sands, deep water & arctic drilling etc. are not just poisoning communities and polluting whole ecosystems but reshaping the very fabric of our societies. When mediated through the mechanisms of globalised capitalism, and its associated markets, these changes are in no way confined to the areas where fracking is actually taking place. As a greater and greater portion of the global economy must be devoted to fossil fuel extraction, the resources available for other activities must be proportionately reduced. The fossil fuel extraction industry has grown from under 4 percent to over 11 percent of the global economy in a short number of years, which has necessitated massive redistribution of resources. While much of this redistribute has been market based, through the mechanism of rising energy prices, this has been followed up by more deliberate, state focused re-allocations. Of course in any such economic re-alignment there will be winners and losers, and as you would expect large energy related corporations, and their sub-contractors, have generally been the main winners. While the system is already well adapted to make sure that those lowest down the pecking order feel the brunt of such changes, the last 5 years have been dominated by efforts to insulate corporate capitalism from and displace even more of the burden onto ordinary people. In this respect the pervasive and widespread effects of fracking, its economics ones, have already crossed the Atlantic. Mediated by globalised energy markets the costs of fracking, and other extreme energy extraction like tar sands, are already being born by people in this country. It is far from coincidental that the two major new political issues of our time, fracking and austerity, emerged at the same time but this a is topic which the current system cannot bear to face. Dominant Issue For 21st Century This brings us to the heart of the matter, fracking is not just another environmental issue, but a key symptom of Extreme Energy, the complex interplay between the inevitable resource exhaustion caused by the voracious global economic system and the system’s increasingly desperate responses to that depletion. This is a process, like “climate change”, which is only set to grow in importance, and seems likely to dominate every aspect of the 21st century. As easier to extract fossil fuels are used up, and that is happening at a frightening rate, only harder to extract ones remain to take their place. Without massive cuts in energy usage, this is a process that can only go in one direction. There are a number of even more costly and damaging extraction techniques being lined up behind the current crop, fracking, tar sands etc., such as underground coal gasification, oil shale (not to be confused with shale oil) and methane hydrates. While “climate change” is portrayed as the issue to end all issues, the reality somewhat more complex. The cumulative effects of carbon dioxide emissions into the atmosphere are constantly growing, but it is entirely unclear when and if changes to the global climate will dominate over the socio-economic and local environmental effects of fossil fuels. While half a million people a year are being killed by climate change, 5 million are killed directly by fossil fuel pollution and many millions more by the intensifying wars to control these dwindling resources. The climate change fatalities will grow but at present other impacts are growing much faster. Ironically we are now in a position where we have a serious fight on our hands, even to get to the point where climate change is our greatest problem. The disproportionate focus on climate seems to be linked to its “safe”, distant, abstract threat - a worry that requires no immediate action for the middle classes who have been insulated from the direct effects of fossil fuel extraction, up until now. Fracking on the other hand changes all that. Not only does it bring the threat of immediate impacts to doorsteps of anyone within a licensed area, it also crosses all class boundaries, pitting local communities, rich or poor, against the corporations of the fossil fuel industry. 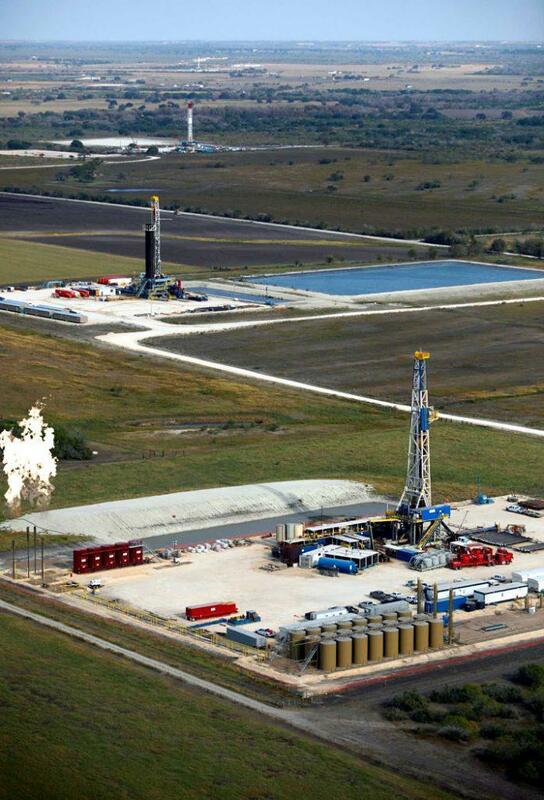 Even the perceived rural/urban divide is illusory, with fracking sites creeping into the edge of Texan cities. Once the economic impacts of fracking are factored in fracking is a threat to everyone, save perhaps the most privileged. As importantly fracking gets right to the heart of the continuation of the current system. Fracking Resistance Fighting fracking isn’t about begging the political classes, who arguable don’t have the power if they had the will, to a bite the hand that feeds them and start dismantling the current system. Instead it is about getting in front of the leading edge of fossil fuel exploitation and standing in the way of global capitalism expanding its use of fossil fuels. Shutting down established institutions is always going to be much harder than stopping something new from starting. In the new normal we now inhabit it is no longer necessary to fight the status quo, because the continued existence of the system depends, not on business as usual but constant, aggressive and radical change, whether that is the development of new resources exploitation techniques or new rounds of brutal austerity. Talk of banning fracking is like talk of banning capitalism or world trade, lots of hot air but the system must keep rolling on regardless because it has no other choice. There are only two real sides in the fracking fight, pro-energy consumption and anti-energy consumption. But of course even this is only a transitory dichotomy, in the long run fossil fuels will be exhausted, human energy consumption will fall massively, and with it the social constructs which have seen half the worlds population move into cities over the last century. The trans-national corporations, mega-cities, and neo-colonial empires which have been so constructed, have a major difference from anything which preceded them. All these inhuman entities require fossil fuels in order to exists and will fight tooth and nail to maintain access to them. We are faced with a fight to the death, where there is no second place. Either we destroy the massive corporate entities which presently control our existence or they will they will drag us down with them in us. Like the peoples of some earlier era’s, such as those who resisted the industrial revolution, we are faced with a system which is trying to change itself, and us, fundamentally. Like them we will be ridiculed for standing in the way of such “progress”, but the hollow nature of such mythology becomes increasingly stark by the day. Unlike the past we have two clear advantages. Firstly the current system’s need for change is much more desperate and delays more likely to unmask that desperation, if not completely destabilise it. Secondly present communications technology means the scope for coordinated local action across whole countries or even globally, to block or at least delay these these measures, seems far greater than it has ever been before. Wherever fracking companies want to drill there are threatened local communities who, with the right information, can be a thorn in their side. A few thorns can be dealt with but thousands, or millions, is another story. This is the greatest challenge humanity has ever faced, but while the stakes could not be higher, at least this time real systemic change is inevitable. The capitalist-industrial system has been digging its own grave for a long time, the only question is whether these unavoidable changes can be steered in a positive direction. Building a broad based, but radical, decentralised resistance to the system’s attempts to sustain itself a while longer is crucial. On the fracking front a good start has been made in resisting attempts to sustain the system a little longer, through an intensification of destructive energy extraction. 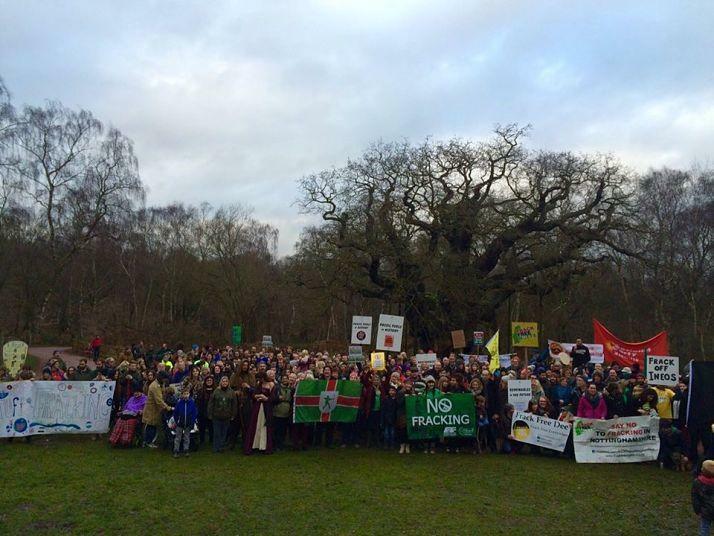 [caption id="attachment_9448" align="aligncenter" width="714"] Protestors oppose Ineos fracking plans at the Major Oak in Sherwood Forest 07/01/17[/caption] Current Fracking Frontlines The present fracking situation in this country can best be described as a slow motion invasion, being fought on numerous fronts, most actively by threatened local communities, in a manner reminiscent of guerrilla warfare. Not that you will find many Kalashnikov toting partisans in the home counties, or even Lancashire, but strategically, the modus operandi has many parallels. 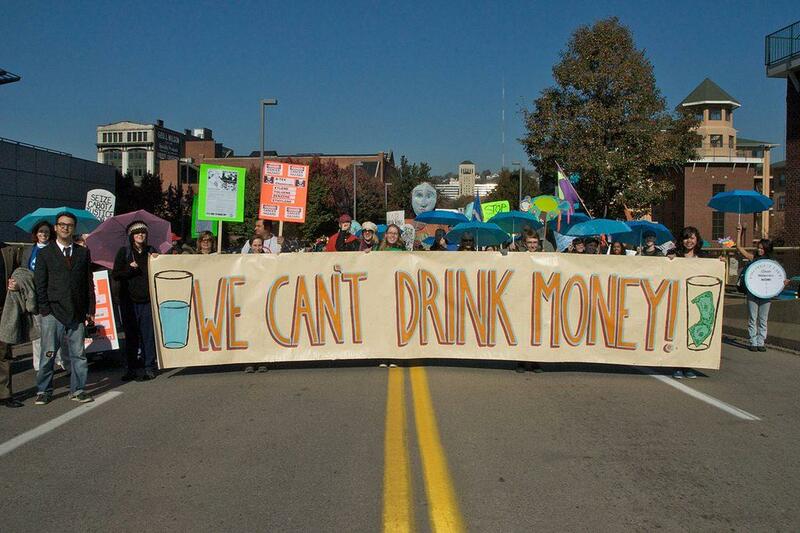 Fighting on numerous small fronts, the currently 260 plus local anti-fracking groups, have been delaying and ramping up the costs of fracking projects, wearing down the opposition and deterring investment on which the industry relies. Not a single well has been hydraulically fractured since Cuadrilla’s disastrous attempt at Preese Hall (where the well was damaged by an induced earthquake), and the number of vertical test wells (primarily to obtain core sample) have been vastly reduced from that planned. This is no reason to be complacent, the industry is in the process of lining up the most significant assault to date and the threat is spreading as more areas have been licensed. That said, the growing threat is mobilising more resistance every day and this community-based movement seems unlikely to be a flash in the pan (these communities have little choice but to stand and fight). While all licences areas are under some threat, as well as many areas which are not licensed, there are definitely areas where the threat is more immediate that other. 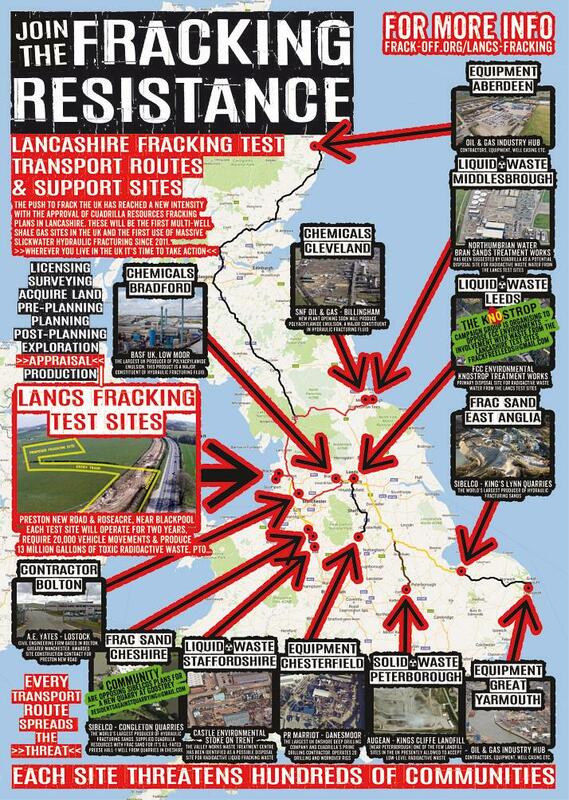 Below are listed some of the most important frontlines in the fight against fracking: Lancashire – Cuadrilla Resources (Shale Gas) Fracking company Cuadrilla Resources has plans for 2 large appraisal sites in Lancashire as it attempts to overcome years of delays in its attempts to . These are the largest propose fracking sites in the UK to date, with 4 horizontal wells each, and would require 2 years of drilling and hydraulic fracturing, producing vast quantities of toxic and radioactive waste, needing in the region of 20,000 truck movements per site. Last year fracking company Cuadrilla Resources came up against enormous community opposition in Lancashire and its 2 flagship UK fracking projects were rejected by the County Council. This was a major blow the UK industry as a whole. The company started work at one site (Preston New Road) on the 5th Jan and a planning inquiry on the other site (Roseacre) has been re-opened. Sussex/Surrey – UKOG etc. (Tight/Shale Oil) The threat of tight (shale) oil extraction in the Weald (between the South and North Downs) in Sussex and Surrey is growing fast, with UK Oil & Gas Investments (UKOG) acting as its main cheerleader. A consortium of fracking companies (including UKOG) is planning to apply for permission for further flow testing of the Horse Hill well (including the Kimmeridge Clay shale layer) in Surrey soon. Meanwhile Europa Oil & Gas also want to target the Kimmeridge Clay during the drilling of their planned Holmwood-1 well at Leith Hill. UKOG have also just acquired the Broadford Bridge site in Sussex, which has planning permission for a well to be drilled. At an existing well at Brockham in Surrey there are also plans for a new sidetrack targeting the Kimmeridge Clay. Exploitation of the Kimmeridge Clay would require thousands of wells to be drilled on hundreds of sites across the Weald Basin. North Yorkshire – Third Energy (Tight/Shale Gas) In North Yorkshire, as in Lancashire, the Bowland Shale is the primary target, and companies are scrambling to try to exploit it. Cuadrilla and INEOS have recently acquired licences in the area, but an existing licence holder Third Energy has a head start, with planning permission for a hydraulic fracturing test on its Kirby Misperton well obtained in May. The company plans to initially target tight sandstone layers within the Bowland Shale (so called tight gas), but unconventional extraction is very similar to shale gas, and would likely be a first step East Midlands – IGas Energy (Shale Gas) A major fracking push is also underway in North Nottinghamshire where IGas Energy (with the backing of Total) are threatening communities in Bassetlaw, with a planning application for a shale gas exploration site with 2 wells at Misson and has submitted another application for one well on another site at Tinker Lane near Blyth. While IGas seem to be in increasing financial difficulty, and may or may not be in much of a position to act of any planning permission they obtain, the licences could easily be sold or a new partner brought in to push the project forward. Licensed Areas – INEOS etc. (Seismic Surveys) The long delayed 14th licencing round has seen an additional 6,000 square miles of licences offered to fracking companies. In particular Fracking company INEOS Upstream (a subsiadary of INEOS the chemical giant) is planning to carry out a seismic surveys across the its newly acquired licence areas and is targeting South Yorkshire, Derbyshire and Nottinghamshire first (with Cheshire and North Yorkshire likely to follow). INEOS has contracted Fisher German Priestner as their land agent to try to gain access to the land they need for the surveys. Getting organised and networking with other people to share information about the seismic survey plans in a threatened area is essential. A conspicuous campaign across the survey area to inform residents of their right to refuse access is an essential first step. Whole Country – Fracking Support Industries Before you breath a sign of relief that you don’t live in an area currently licensed for fracking you might want to consider the network of support activities required to enable fracking. Each fracking well requires 20,000+ truck movements, but while the number of wells per site is limited by practical considerations, at the other end of those journey’s support sites may see 100,000’s of vehicle movements. Those fracking trucks might be fetching sand and chemicals, or taking away toxic/radioactive waste. Particularly threatened areas include Cheshire/Norfolk (Sand Mines), Leeds/Middlesborough/Stoke-on-Trent (Liquid Waste) and Northamptonshire (Solid Waste).